Is he best up forward? Or in defence…? It’s a question that’s surrounded versatile tall Dan McStay for almost all of his career at the Brisbane Lions since being drafted in 2013. After a slow start to the season, McStay had one of his best games of the season last weekend against North Melbourne playing up forward. “I like playing forward especially the way we are moving the ball now. 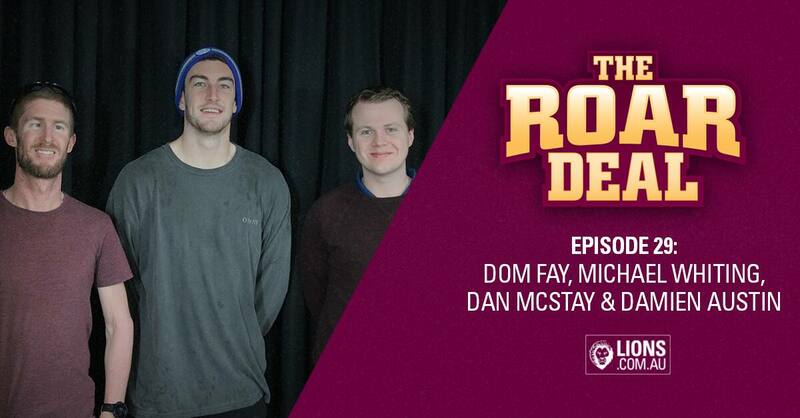 Our midfielders are getting on top at times which makes it easy,” McStay (@21.05) told hosts Dom Fay and Michael Whiting on the Roar Deal podcast. “Five years in my body is at a stage where I can compete and do well against those bigger bodies. McStay admitted that it has been challenging locking down his preferred spot. “This pre-season we sat down and had a chat. I said to him [Chris Fagan] that I want to train forward and that’s where I see myself playing footy,” McStay said. “I spent the whole pre-season training as a forward. It got to a stage where the practice matches were starting and Fagan said, ‘I want to throw you down back just so you know all the roles if someone goes down’. “I started training a little down back. Round 1 I played the first quarter as a forward, and then switched with Josh Walker into defence. As one of the more senior players at the Lions now, McStay is committed to making the Club a welcoming place for the new draftees. “You definitely feel a connection with the Club. I’ve seen so much change and see so much good at the Club now, you want to keep it rolling and keep all the young guys invested. The Lions’ High Performance Manager Damien Austin (@47.24) also joined the Roar Deal podcast to discuss the recent injuries to key players. “You try your best to manage athletes as best as you can, but some things you just can’t control,” Austin said. “It’s not all doom and gloom. Yes, we’ve lost Charlie for the season, but we have most of the other players coming back after the bye. Austin also discussed what’s changed at the Lions since he started in late 2016, how draftees are introduced to pre-season training and Sam Skinner’s return. High Performance Manager Damien Austin updates our injury list on the #RoarDeal.